Journalist Jakob Johannsen, who is married to a Somali woman, contacts Claus Bindslev with a proposition to “turn Somali pirates into fishermen”. Claus Bindslev and Jakob Johannsen contact international development journalist, author Knud Vilby. Together they agree to start a fishing project in Somalia. December 2009 – March 2010: Who joins, and who leads? Meetings with the Danish Minister for Development Cooperation Ulla Tørnæs and The Danish Ship Owners Association in March 2010, who support the idea, in principle. Contact established with Christian Balslev-Olesen, Head of UNICEF in Somalia, in early 2010. Johannsen oversees further development of the FairFishing concept, with Bindslev A/S. One of Johannsen’s most important contacts Nils Wang, Rear Admiral and President of the Royal Danish Defence Academy, an avid believer in issues at sea having to be dealt with on land. The Danish Ship Owners Association pens a letter of support, and recommend recruiting Somali nationals Said Hussein, General Secretary of Somali Diaspora Organisation (SDO) and Mahad Aden, internal auditor at Denmark’s National Bank. Both join the yet formally unestablished FairFishing task force. 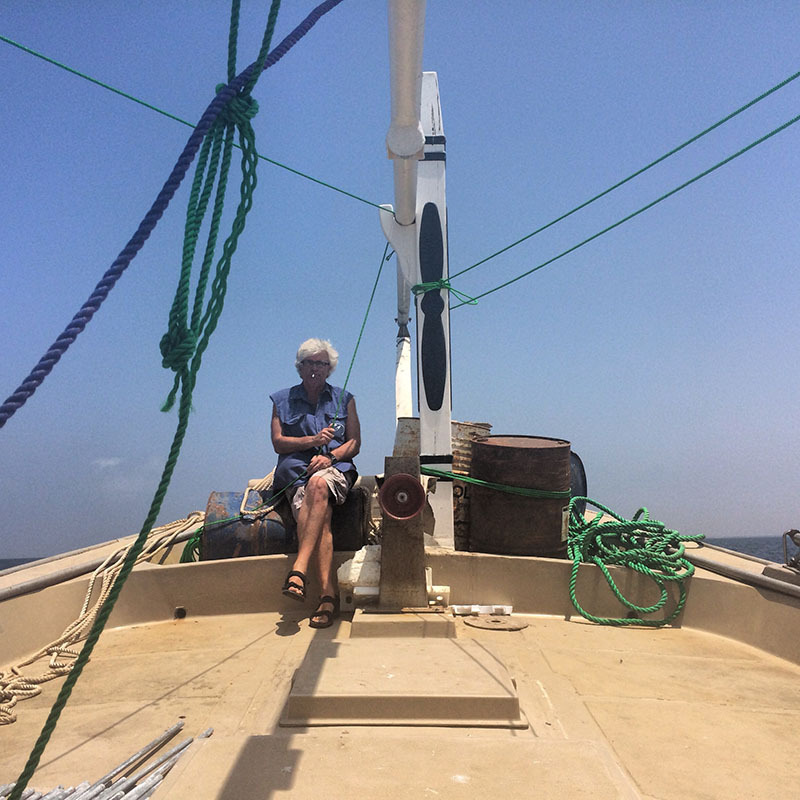 Contact established with Kurt Berthelsen-Christensen, a skipper with significant experience in building fishery capacity in Eritrea and the Aral Sea, who contributes with his specialist knowledge in further establishment of FairFishing. The first Board consists of Claus Bindslev, Jakob Johannsen, international development professional, author and journalist Knud Vilby, Said Hussein and Mahad Aden. Former Head of UNICEF in East Africa Christian Balslev-Olesen joins later. Danish strategic advisers Bindslev A/S supply secretarial assistance whilst FairFishing takes shape. Johannsen is diagnosed with cancer. Further development of the concept, and funding applications. Introductions to the Ministry of Foreign Affairs (MFA) and the Danish ambassador in Nairobi in February 2012. An article on the project in Danish newspaper Politiken Weekly results in the donation of USD 20.000 from the American Arsenault Family Foundation, for a fact-finding mission in Somaliland. Purpose: Is fishery even possible – if so, how? Week long fact finding mission to Somaliland. Johannsen too ill to participate. Upon arriving home, the team pens the first project description based on the facts found indicating that there is no existing infrastructure, and that a processing facility offering ice and fish processing at cost prices must be built from scratch. A decision is made not to choose one local partner, because the fishery and the operators are too fragile: FF openly expresses that anyone is invited to cooperate, as long as they share the same ambition as FF: turning Somaliland into a nation of fishermen. The principle of open inclusion is key. Founding father Jakob Johannsen passes away. Gullestrup, whose own experience of having a ship highjacked by pirates was the basis of the movie ‘The Hijacking’, donates USD 50.000 towards a Proof of Concept phase: Demonstrating that one tonne of fish can be caught, processed and sold every day for an entire month. Should the project succeed, it would validate the assumption that there is great potential for stable income and jobs in the fishery industry in Somaliland. The Proof of Concept phase is a success. Carl-Jørgen Bindslev joins the team permanently as Chief Secretariat Officer. A processing facility is developed; using five 40-foot reefer containers donated Mærsk Line as the source of infrastructure. An ice machine is purchased. The organisation changes its name from Somali Fair Fishing to FairFishing to avoid political discussions on the issue of Somaliland’s relation to Somalia or Puntland. FairFishing receives an increasing amount of both in-kind and economic donations. Negotiations are moving forward between the MFA/Danida and FairFishing, with FairFishing thus far receiving no public funding. 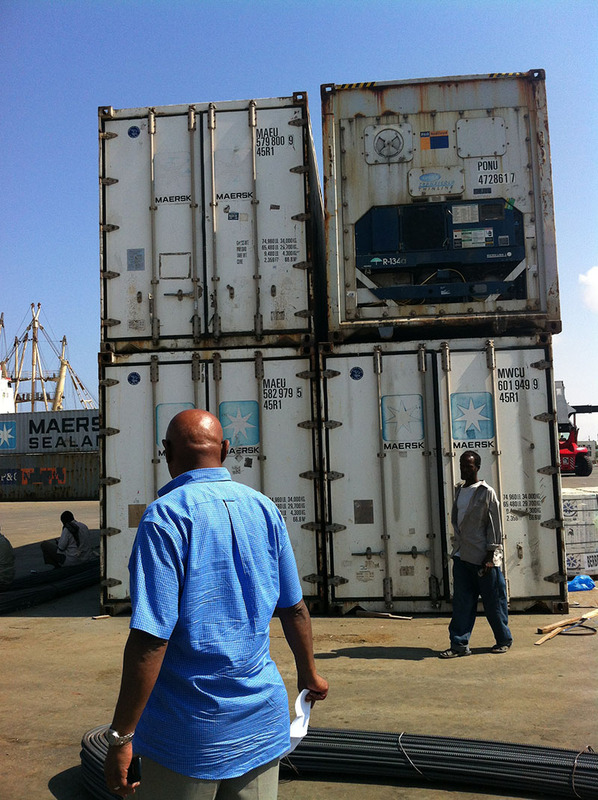 Reefer containers arriving at the Berbera Port on Christmas eve 2012, ready to be merged and converted into a fish processing station. FairFishing is nominated for the INDEX/design to improve life award, in the community category. 20 people are employed at the station within the first year. Wages are paid for by the many fishery companies who sign on as partners in order to receive ice, processing services, storage rooms etc. at cost prices. FairFishing is non-profit. 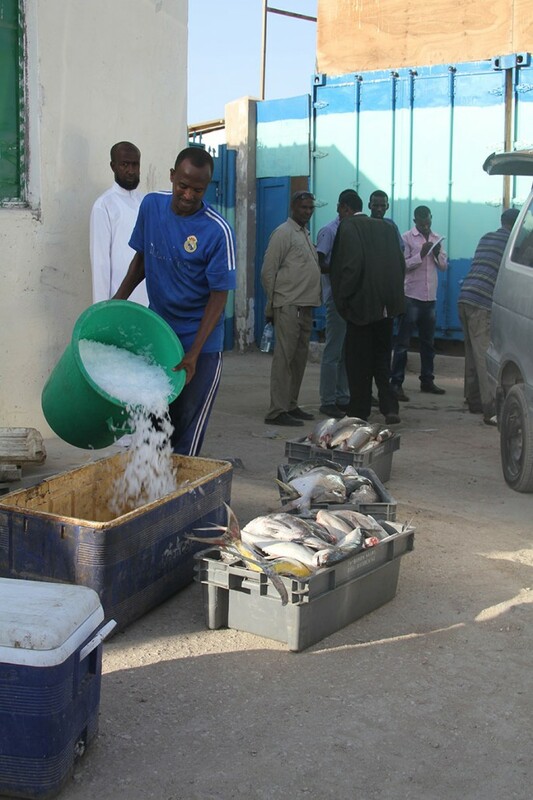 In 2013, FairFishing Somaliland is established as an international NGO, while cooperating with the Somaliland Ministry of Fisheries in a mutual understanding of the need to develop fishery in Somaliland. A series of negotiations between FairFishing and Danida, notably Minister for Development Cooperation Christian Friis Bach, take place. Attempts are made to find a sustainable financial model. Negotiations stall upon the resignation of the Minister for Development Cooperation Christian Friis Bach in November 2013. The three-man Management Team, Yusuf Gulled (country director), Jama Ashur (fishery manager) and Mahad Ahmed (finances and administation) is employed at an office in Berbera. Television programme DR Horisont broadcast a documentary on FairFishing in May 2014. A governmental delegation from Mogadishu visits FairFishing in Copenhagen, wanting to replicate FairFishing’s concept of FairFishing in other location along the Somalia coastline. The A.P. Møllerske Støttefond donates USD 500.000 FairFishing, at a critical time. The station is up and running, but it has been necessary to reduce the local employees’, as FairFishing is running out of money. A plan of action is established for the period 2014-2017: Consolidating existing activities, training and developing the capabilities of the fishermen, ending in a transition to local ownership in 2017. The CEO of Centre for Culture and Development (CKU), Elsebeth Krogh, joins the Board. Toyah Hunting now heads FairFishing’s Partnerships and Communication. Mærsk Line donates USD 34.000 towards an Impact Assessment of FairFishing activities by Nordic Consulting Group (NCG), aimed at finding the actual local effects of FairFishing’s efforts on Somaliland in terms of heightened income, employment and reduction of poverty. FairFishing ships two containers with equipment, donated and purchased equipment at a total value of USD 500.000, to Berbera. It is to be sold to our 37 local fishery-partners at cost price through the Partner Supply Unit, that is under construction in the FairFishing Berbera compound. The Partner Suppy Unit opens, including a net production unit. Nordic Consulting Group’s (NCG) Impact Assessment of FairFishing is published. , highlighting our results so far. 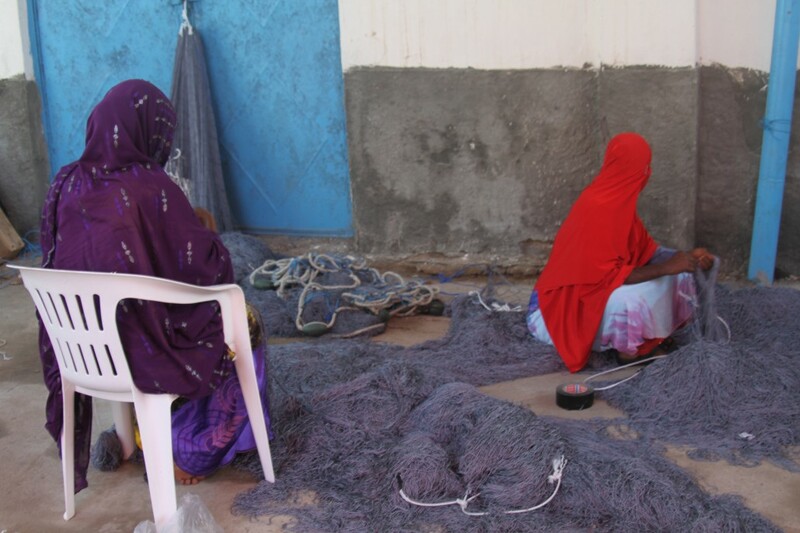 In mid-2016, FairFishing received a grant from the European Commission, aiming to boost income, livelihood and nutrition through a fishery-based economy at the Horn of Africa. For the coming years, until end 2018, FaitFishing will develop more fishery stations along the coast of Somaliland and Puntland, and establish or improve fish markets in several in-land cities to support the whole fishery value chain. Until early 2017, we are validating the action plan to ensure that we achieve the biggest possible impact with the funds at hand.